No Way Back is not a festival, it is not an event - it is a party. What began in an abandoned Detroit building with a leaky roof (it rained on the dance floor!) and an audiophile sound system has now moved to the entirely legal and historic 1515 Broadway, home to the original Music Institute where Derrick May solidified his international reputation as artists like Depeche Mode and New Order would make their way there to hear the musical revolution of groundbreaking DJs like D Wynn and Chez Damier. Every generation experiences this, whether it was at The Sanctuary, Better Days, The Loft, The Paradise Garage, The Warehouse, The Shrine, Cosmic, Luomos, The Muzic Box, The Hacienda, Medusa's, The Music Institute, or Berghain. You might not even know that you have soul until you experience being totally lost in the sound and realizing there is no way back, at all. Every DJ chosen to play at No Way Back is a master of their medium, so deep in it that they all serve as constant inspirations. This is a celebration of the lost art of the late night Midwestern DJ. 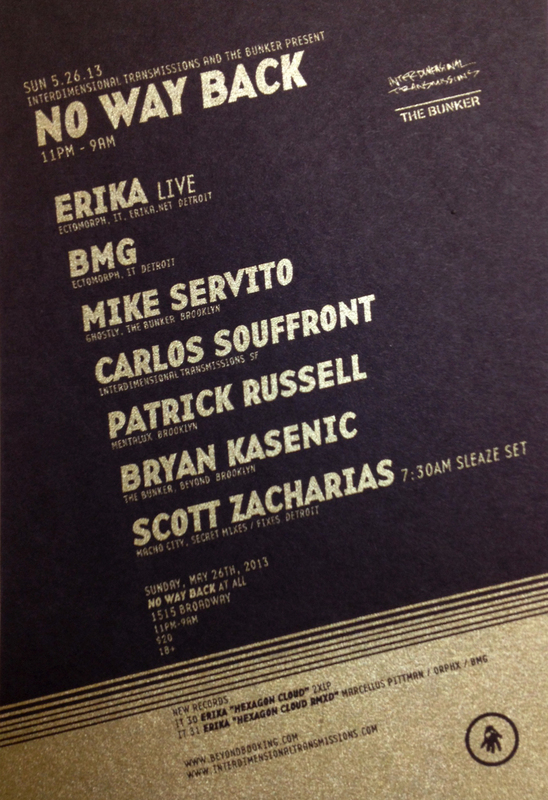 This is what makes the collaboration between Interdimensional Transmissions and the The Bunker so effortless, as they both are champions of this, with The Bunker residents like Mike Servito and Bryan Kasenic being long time IT collaborators. The daughter of a famed scientist and already running a well known BBS from her bedroom by the time she was 13, Erika is no stranger to expressing her ideas through technology. In 1997 she was handed a TR-606 and asked to join Ectomorph, and has since become an electronic musician of the highest order, focusing on analog synthesis, with live hardware sequencing that allows transformation over time and a deep depth of tone. Erika will be performing material from her debut LP "Hexagon Cloud" (due out the first week of June) on far too much analog equipment. Brendan M Gillen founded Interdimensional Transmissions in late 1994 when he heard far too many ancient voices in his head. Positive that dimensions were colliding and that he could literally feel the deepest will of some mystic past, he decided not to ignore these voices but to contemplate their input, and thus Interdimensional Transmissions came to fruition and the idea-based project Ectomorph found a true home. Since then the vision has continually grown organically and mutated into something that is hard to describe yet easy to feel. His sets effortlessly combine a multitude of seemingly disparate genres into a coalescing solid sound system sensation - pure transcendent psychedelic wizardry. A polymath or sonic alchemist or something. He has recently produced Erika's solo debut, provided a remix for "Hexagon Cloud RMXD" and collaborated with her on the song "Gardeners". Patrick Russell is a true veteran of the underground, perhaps one of the last unsung heroes of a now lost era in the Midwest. He magically transforms the diaspora of pure jack energy into a fluent sonic dialog that never fails to devastate the dance floor. A Detroit-bred DJ, artist and producer since the early 90's, Patrick has played countless clubs, parties, and high-profile events throughout his career. His resume highlights include everything from performing at the 2001& 2008 DEMF/Movement festivals, an exclusive opening for Jeff Mills in Detroit in 2007 to decorating(!) and performing at the now legendary leaky first No Way Back. His taste has always been impeccable and his sets just get better and better as time progresses. And fans in Detroit and his now native Brooklyn are taking notice, as many of them are singing the praises of his artistry very loudly these days. Bryan Kasenic (aka Spinoza) is known in the electronic music world for throwing many incredible parties, playing adventurous DJ sets, launching an influential newsletter, and starting Beyond, his own booking agency. The past few years have seen Spinoza take his infamous Brooklyn-based party, The Bunker, to Unsound Festival in Krakow, Communikey Festival in Boulder, Decibel Festival in Seattle, Pittsburgh, Chicago, Philadelphia, and of course Detroit. The Bunker celebrated it's tenth anniversary in January. Scott Zacharias is musically ambidextrous, the co-founder of both Detroit's Macho City and Disco/Secret with Mike Trombley, and the original resident of Oslo. He started in thrash bands as a teenager then moved on to space rock project Monaural before his interests in Jazz ultimately led him to the traditions of Detroit's deep house DJs, and then beyond into a truly expansive almost psychedelic take on Disco and all its weird friends. He has blossomed into Detroit's best kept secret, a true student of freeform dance music. 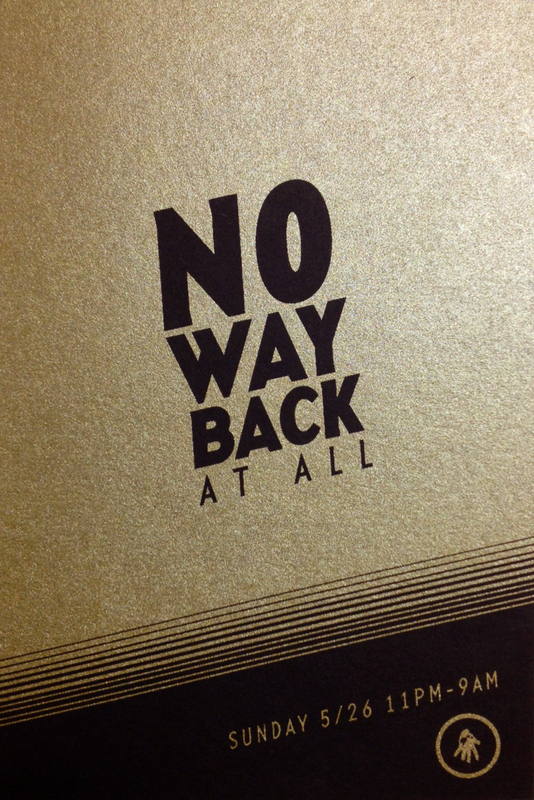 For this year's No Way Back At All at 7:30AM Scott will perform a Sleaze set, a special kind of low-tempo disco championed in leather bars in the late 70s, usually played in a euphoric post coitus way, deeply lost in the groove.